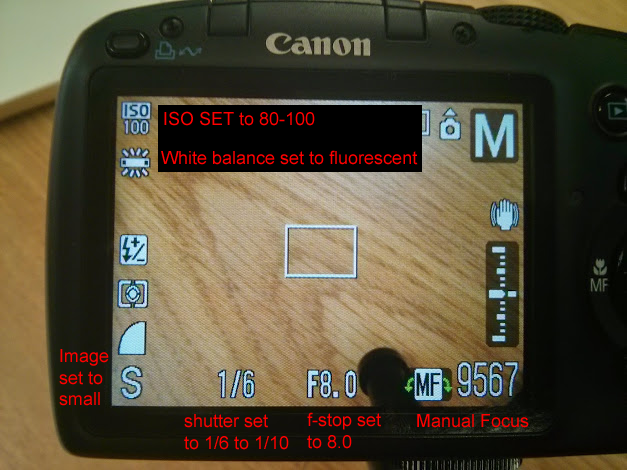 I can: set the focus to manual, adjust the iso, white balance, image size, f-stop and shutter speed. 1. To import a sequence of pictures, we will need to use some software. The easiest way is to use quicktime pro 7. You can find it here. 2. Once you have it on your computer, double click and to open the program. Now follow these easy steps. ii. Navigate to your folder that contains your pictures and click on the first picture you took. iii. Select the # of frames per second. Try 15. 3. Let's see how this works using your pictures from last class! Let's have someone from each group come up and follow the 3 easy steps. 4. Now let's try again and make it better. Here are a few helpful tips. PROJECT: 5 - 10 seconds of filming, better than last time. YOU CAN DO IT! Today we are: learning how to setup the camera. 1. Before we begin, we need to make sure we setup our cameras correctly. This quick tutorial will show you how to setup a Canon camera so it always takes the same pictures. 2. It should now look like this. 3. Now lets take some pictures! Try to take some pictures for a brick animation and we will see how it looks next class. PROJECT: 5 - 10 seconds of filming. Other than that, it's all up to you! I can: use a microscope properly. I can: list the basic components of a cell. 1. Today we will look at the idea of gravitational fields and universal gravitation. 1. Today we will be preparing a wet mount slide of actual cells and then exposing them to different environments to see how they react. 1. Introduction of cell functions; diffusion and osmosis. 2. Go to your classroom. 3. Complete your work on cell functions.